K-kits are sample holders designed to facilitate convenient TEM observation of liquid samples, allowing nanoobjects, aggregates, and agglomerates (NOAAs) in liquid samples to be characterized. 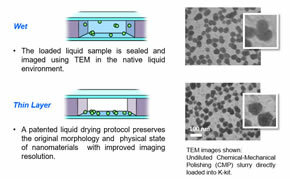 With vacuum compatible sealing of liquids in electron-transmitting thickness, K-kits are micro reaction chambers for countless experiments in materials, chemical, and biological research. 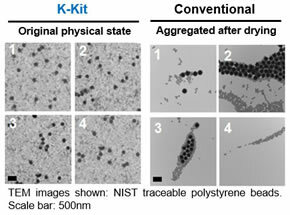 The table below shows the test results of K-kit sealing epoxy soaked in chemical solvents for 24 hours and then examined using FTIR, Fourier Transform Infrared Spectroscopy, (if dissolved) and visual observation (if dispersed). Tools are optional available in a Tool Set or ordered individually. The glues are also available. Figures are for illustration purposes. The tools you order may be different in color and/or from minor design changes. Two gap heights (H) available: 0.2µm or 2µm. Two package options: 4 or 6 K-kits per pack. Additional gap heights and pack sizes available upon request. The K-kit Tool box is available in silver. It houses a full tool set, including K-kit holder, Sample Loading Stage, Needle Pen, Gluing Stand, Channel Opener, Sealing Glue, Mounting Glue, Glass Slides, 6/pk of K-kits, Shipping Box (empty), and some replacement parts. The K-kit Holder consists of an anodized aluminum header and a stainless steel handle. The K-kit carrier fits on the header (after removing the bottom compartment). When the notch on the side of the header fits over the horizontal bar on the Loading Stage (see below), the K-kit on the carrier attached on the header will be just above the liquid sample. The Loading Stage consists of an anodized aluminum body. It has a horizontal bar in a recess on the side and a hole in the middle to house the Liquid Stage, which is a removable stainless steel rod. The removable design is for easy cleaning. The horizontal bar defines the rotational axis for the K-kit Holder, which has a notch on the header to fit on the horizontal bar. The Needle Pen is designed to facilitate the K-kit gluing operation. 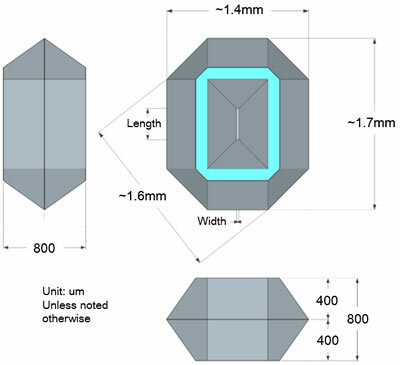 It has a thin needle 3.0 mm long and 0.27 mm in diameter. The thin needle makes it convenient to pick just enough glue (of the order of 0.1µl(x)) for sealing the channel openings and (around 1µl(x)) for mounting the copper grid. The needle is made of stainless steel. It is strong, yet slightly flexible, suitable for the job. It is important to keep the needle free of residue glue. Please wipe the needle clean right after each use. It will be practically impossible to clean the needle once residue glue on it cures. The needle is held in place in the pen by a set screw on the side of the pen. A replacement needle and a small Allen key are provided with each Needle Pen. The needle is sharp. Please handle with care. The Gluing Stand has a stainless steel base and an anodized aluminum header, which is much like the header on the K-kit holder, without the notch on the side. The Gluing Stand keeps the K-kit carrier in place for gluing work. 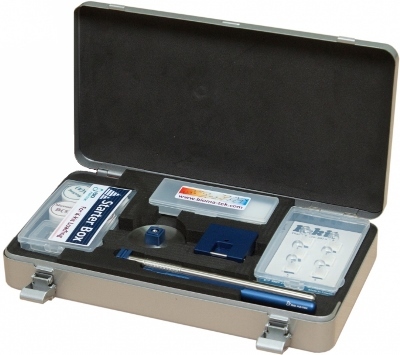 The Accessory Box contains essential kits and spare parts for the K-kit tool box. Includes sealing and mounting glues, stirring sticks, channel opener, spare needle for needle pen, liquid stages for sample loading stage and an Allen key for the needle pen. The Starter Box contains all of the essentials for K-kit loading. It consists of sealing and mounting glues, stirring sticks, gluing needles and a channel opener. The Glue Box contains sealing and mounting glues and stirring sticks. Glue capsules will now have a tin foil seal on the bottle mouth for shipping. Sometimes during shipping, the glue could become stained and dried on the cap or bottle mouth of the capsule. Sometimes, the Torr Seal glue will have a thin oil-like layer on the surface. This will not affect anything and is normal. Please stir first to mix evenly. 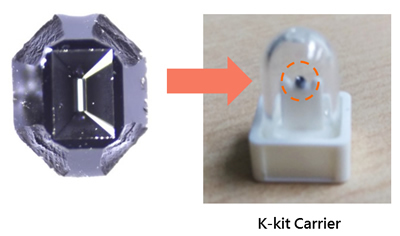 The Channel Opener is used to remove the channel tips, while the K-kit stays on the carrier. It's made of anodized aluminum with a cut-off slot design at one end. Ten pieces of Copper Grid per pack. Six glass slides per pack.